I have seen many dead skunks on our local roads lately. Had I asked my grandmother what kind of sign this was, she probably would have wisely said “it’s gonna be a bad year for the poor critters.” I recognize and understand the profound wisdom in that statement. Nevertheless, it seems like the mortality rate here in late Winter and early Summer is abnormally high. When I was a child, my father would incorrectly refer to the foul odor on the highway as the result of a “polecat.” Later in life I would realize that a “polecat” was an animal similar to a ferret. 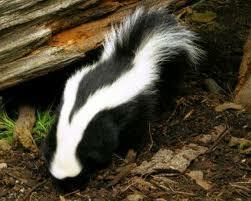 One fact was certain, if we passed a dead skunk we would surely smell the foul odor for many miles on down the highway. I am a loyal fan of the musician Loudon Wainwright III and have amassed a trove of his recordings over the last 40 years. His “hit to be remembered by” is an eclectic song named “Dead Skunk In The Middle Of The Road” from 1972. Anytime I pass a dead skunk on one of our local roads, I always find myself singing his silly song. “Take a whiff on me, that ain’t no rose! This entry was posted in Animal, Flora and Fauna and tagged Boston Mountains, Dead Skunk, Loudon Wainwright III, Odor, Skunk. Bookmark the permalink. Another great post! Just sayin’ . . .